Leeds United’s run of four away games without defeat came to an end as they lost 2-0 to Brighton at the Amex Stadium. After the high of Saturday’s victory at Middlesbrough, the Whites were brought back down to earth and could have no complaints about their loss after rarely looking like scoring for much of the contest on the south coast. United were forced to make two changes from the side that won at Middlesbrough with Liam Cooper back in defence for the suspended Giuseppe Bellusci and Casper Sloth in midfield in place of the injured Sam Byram. They started solidly enough without creating much, although Rudy Austin and Luke Murphy did fire long distance shots off target. Brighton’s first serious attack saw Joao Teixeira head just wide as he met a cross from Craig Mackail-Smith. They then took the lead on 26 minutes through Sam Baldock, who finished from close in after another Mackail-Smith cross. Brighton had suddenly upped their game and could have doubled their lead soon after as the skilful Teixeira put Mackail-Smith through only for Leeds keeper Marco Silvestri to save with his legs. Liverpool loanee Teixeira came close himself with a shot that went just over after a probing run. United did fashion one decent attack when Sol Bamba was narrowly unable to meet Murphy’s cross, but the hosts were worthy leaders at the break. Leeds suffered a blow early in the second half when the industrious Steve Morison picked up an injury and tall Albanian striker Edgar Cani was brought on. There was little good service to the new forward and it was Brighton who continued to look the more likely to score. Inigo Calderon hit a shot wide and only a great tackle from Scott Wootton denied Teixeira. Alex Mowatt could not repeat his recent heroics as his free-kick went over, but United were soon defending again with Silvestri having to save two shots from Teixeira. Brighton did make it 2-0 on 63 minutes when the ball went into the net off Calderon after Silvestri had pushed out a shot by Beram Kayal. Bamba sent a header wide from Murphy’s corner as the Whites tried to hit back. Leeds boss Neil Redfearn threw on more forward power in the shape of top scorers Mirco Antenucci and Souleymane Doukara and the latter almost pulled a goal back with a clever back heel that was saved by home keeper David Stockdale. But it was the hosts that came closest to another goal as Silvestri tipped Dale Stephens’ header onto the crossbar then reacted well to save the follow-up from Chris O’Grady. 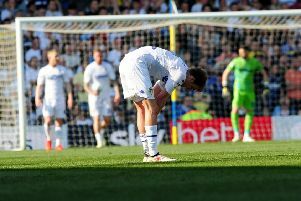 Teixeira also hit the woodwork in injury-time, but it did not matter as Leeds’ run of away wins had been ended. The defeat did not do United much damage relegation-wise with most of the sides below them losing and they remain 10 points ahead of third from bottom Millwall. Brighton: Stockdale, Bruno, Greer, Dunk, Bennett, Ince, Kayal (Stephens 73), Teixeira, Calderon, Mackail-Smith (O’Grady), Baldock (Lua Lua). Leeds: Silvestri, Wootton, Bamba, Cooper, C Taylor, Austin, Cook, Murphy, Mowatt (Doukara 73), Sloth (Antenucci 59), Morison (Cani 49).